No artist is solely responsible for a work of art. Every creative work relies on cultural history, collaboration, and the creative contribution of its audience. Harold Bloom, in declining health, is the subject of discussion these days. Not always a fond subject. I went back to the daunting Shakespeare: the Invention of the Human, Bloom on Shakespeare. Daunting, but as I’ve repeatedly discovered, a short essay followed by encyclopedic and subjective discussions of the individual plays: an act of amassment. Bloom’s interests in religion, the divine spark of Gnosticism, cross over here; Shakespeare, says Bloom, did more than just represent consciousness, he created it, in the literary sense and perhaps beyond. 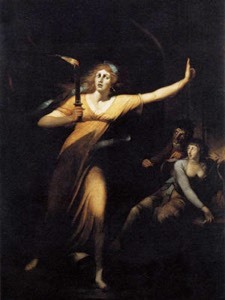 Johann Heinrich Füssli, “The Sleepwalking Lady Macbeth” (1781-1784). Oil on Canvas, 221 × 160 cm. Bloom’s thesis is founded partly in out-of-fashion adherence to universality, and partly in the Shakespeare authorship discussion, which to Bloom is too silly to address directly. But Bloom goes to great lengths to attribute every last work to one man, even in contradiction of accepted scholarship. On first exposure, I—like just about everyone else—shrank from Bloom’s contention of a monotheistic Shakespeare; on closer examination, I’ve revised my appraisal. I didn’t grant adequate credit: the attribution of literary consciousness to Shakespeare is far lamer than estimated. Obvious things out of the way: plenty of literary consciousness in evidence before Shakespeare (Bloom accounts for the Bible by crediting it to the single genius, “J”); Shakespeare was not widely distributed outside the English-speaking world until the 20th century, and to this day is an exotic author in many corners of the world; physiologically, human beings and their brains have been basically the same for the last 50,000 years. Bloom places himself in a tradition of universality, objecting to the disuse of universality as a critical architecture. For Shakespeare to father consciousness, literary or more, he has to have had access to the entirety of human experience. Universality allows for that: it allows Shakespeare to speak to and for all of us. But Shakespeare, with his sprawling interest in human consciousness, is an unlikely champion of universality, as Bloom acknowledges. The specificity of Shakespeare’s characters—psychological distinctions, despite linguistic similarity—places Shakespeare far more comfortably in a criticism that controverts universality. And neither does Shakespeare’s attitude towards publication—indifference—speak for a playwright who believed the world was his audience, or an artist eager to announce, evidence, or preserve a singular vision. Universality is a marvelously appealing oversimplification, but not fundamental of Shakespeare’s vision: not everyone has the same experience of life, and anyone engaging the realities of human life on this vast globe itches at the assertion of Allness. Shakespeare wrote in an era when collaboration was the norm. Along with his contemporaries, Shakespeare borrowed, stole, revised, shared, took credit for. There was no copyright to dissuade anyone from authorial showmanship; and the collaborative cesspool was highly nutritive. Bloom, committed as he is to individual greatness, does what he can to curtail Shakespeare’s partners and sources: sometimes, as in the case of Thomas Kyd’s Hamlet (which pre-dated Shakespeare’s Hamlet) going to great lengths to finagle it. But Shakespeare did collaborate: not only was there no copyright to dissuade him, there was little notion of individual authorship. Shakespeare’s role was more akin to that of a contemporary writer / producer or head writer; he worked with a number of sub-writers, assigning and revising as he saw fit. He also had a cast of actors, hired for the hundreds of previous roles they had played and memorized; they too were a part of the development process. Shakespeare’s market was the premiere form of entertainment, the biggest money-making art form in his culture. He wasn’t writing alone in the dark. For theater performed in English, Shakespeare had the best audiences in recorded history. Not all of the Globe’s audience was educated—but all, or almost all, were educated in the theater of the day. They didn’t watch TV, listen to the radio, or even read books as we know them today. They went to the theater. Just a few men—let’s say two dozen—make for the core of Shakespeare’s generation of playmakers. Gushing awe is easier than the statistical argument, which is that writers like Shakespeare will develop if they have the outlet for the work. Dickens and Dostoevsky, to cite authors that Bloom cites, mastered the forms that the marketplace made available to them. Crime and Punishment, published as is, today? Not with a major publisher. No way. Jonathan Bate, in his recent biography of Shakespeare, Soul of the Age (a title almost as feeble as that of his previous Shakespeare biography, The Genius of Shakespeare) vaults into an acrobatic routine similar to Bloom’s: Shakespeare’s collaborations were incidental; the “missing years” pointed to by Shakespeare revisionists are accounted for; the revisionists are uneducated kooks, etc. There is no address of the underlying argument: our understanding of Shakespeare, now founded on a 20th-century assumption of the artist as genius, is essentially incorrect. Shakespeare wrote in a time of routine collaboration, no authorial copyright, no publication, and little investment in intellectual property, or even intellectual originality. Shakespeare isn’t a yearly recurrence—and I believe he could be—not because he was the messiah, but because we’ve legislated and philosophized Shakespeares out of existence. Bloom and Bate, along with the other traditionalists, as they are termed, are appealingly scented by pipes of cherry tobacco and a casual disdain for popular culture. But universality is popular culture: it is the linchpin of the lowest common denominator, and the activator of the massively idiotic, from schmaltzy rock to kitsch. To tell artists, to tell everyone, that their individual experience must translate to the experiences of everyone else, is to hobble creativity beyond recovery. To tell readers, watchers, buyers that what entertains them and delights them must conform to style or taste or universality (argumentum ad populum) is to create a nation, a world, of zombies. Which is why zombies are so popular, and so frightening: we are zombies. The divide of the Western family—no longer do we live in extended groups of grandparents, uncles, aunts—is also predicated upon a notion of universality, an illusion of commonality. We break ourselves into individual or nuclear units, and perpetuate the ever-unsatisfying lie that our real family is yet to be discovered, that somewhere out there a group of friends or co-workers or peers will form, and that they, unlike our blood relations, will really care about us. Alas, not true, and meanwhile, we’ve dismantled any truer family sanctum that might have offered us contentment, peace, completion. Public education, as dreamed up in the United States after the Civil War, was a Reconstruction tactic aimed at the U.S. underclasses, black and white. The idea was to separate children from their families—to integrate children into the broader culture, and to diminish the influence of thinking independent or critical of normative U.S. societal stratification. Universality is the assumption that binds higher education—that puts us all in the same classrooms, learning the same things about the same books. And, by now, universality is not only a symptom of total assimilation, but of laziness; it happens to be much easier to teach the same books, year after year, generation after generation; it happens to be much easier to write the same books, century to century. In 1600, two hundred million people walked the Earth; today, seven billion. In 1600, London’s population reached the high water mark of two hundred thousand; today, eight million. Off-putting, to dig around for today’s authors. But people who care about books and reading, and the preservation of a creative future, will do it. Arguing that Shakespeare is a singular phenomenon in the history of humanity is akin to arguing that there is no other life in the universe. For a long time, that easy conclusion seemed like the more logical position—we live in an endless, cold void—but the once scientific assessment has since been overturned by statistics. There are just too many other galaxies and planets (and perhaps even other universes parallel to our universe) for us to be entirely alone. Enormously disquieting, to acknowledge how many people are walking around the earth, all of them breathing, and many of them writing: but here we all are—and the more courageous reader, the more courageous thinker, will pick up a new book over, let’s say, Pericles, which is a terrible play no matter who wrote it. To write well is to take a stand against death. Flirting with death is seductive, as is courting death, celebrating death, imagining death. But dying, dying on the page, is no fun at all. A lesson that writers learn early in their experimentations: creating a boring narrative to depict a boring narrative makes for a doubly boring read. That is the divide in the current Shakespeare fracas. Death vs life. Creativity vs bureaucracy. Who Shakespeare was, what his process—all less important than the debate itself. The one side seeks to maintain the Shakespeare biography as is; but, to do so is to concede that there’s nothing new to write about Shakespeare. All that’s left is subjective opining. Their solution: to broadly extrapolate and build on the accepted biography. To look at a year in the life of Shakespeare, for example, and look at it in the context of everything else happening in London. Or, another example, to look at Shakespeare’s testimony in a trial (he said a few words), and extrapolate his involvement. The problem with all that: Shakespeare’s life, as known in verifiable facts, is a slim affair—I’ve seen it all printed on a single deck of playing cards—and the narratives derived are products more of inductive posturing than deductive reasoning. The argument of the Shakespeare revisionists is, “well, if you’re going to make all this up, I’d like to make up something else.” Based on the argumentum ad ignorantiam of contemporary Shakespeare scholars, the revisionists have granted themselves the same right to sweeping, gestural elaborations. Michael McClure has argued that tradition, bureaucracy, is a needed coagulation in the body of humanity—that without conservatives to stem the flow, we’d all just bleed to death. Contemporary authors are forced to pay homage; a repackaged “master,” and they manufacture the preface, or an introductory essay (ostensibly a review) for some magazine. Publishers, in their tidal panics, continuously return to their great masters, and last year Zadie Smith’s Changing My Mind anthologized her half-hearted tribute to E.M. Forster, ‘’Middle Manager.’’ Even Frank Kermode, to whom the reassessment of Forster was entrusted with Concerning E.M. Forster, did little more than spruce up his lecture notes, and assert that the cinematic adaptations of Forster are schmaltzier than the novels, which are, admittedly, schmaltzy. Seventy-five years from now, publishers will be looking for reappraisals of James Patterson. And Patterson, in the minds of those future scholars still clinging to universality, will have been a lone genius who saw to the core of the human condition. The Patterson machine—the many people who work for Patterson, on and for the books—will be pushed from their memories. Which is a real shame, because if there is genius in Patterson, it is in his collectivization of individual talents. Much like Shakespeare. Our age, more a recurrence of 16th and 17th century feudalism than we would like to admit, will increasingly look to art that is collaborative, big enough to compete with corporations. “The School of Caravaggio,” yes, partly like that, but certainly like Hollywood movies, television, and the large-scale narrative serializations we now see in publishing. I can appreciate McClure’s argument. I don’t think we need to stand vigil over E.M. Forster, and I don’t think anyone is going to damage Shakespeare’s reputation, but I concede: “they stumble that run fast.” Yet the analogy doesn’t hold for Shakespeare scholars who have constructed a biography upon creative thinking, and now disallow their adversaries that same process. There is something terribly anemic about the unwillingness to even acknowledge that there is biographical dissent. Especially when there’s so little to fear. When the dust settles, we’ll all know that Shakespeare collaborated, which is something we really should, and most probably do, know already. The revolution undertaken in the Shakespeare world is not the creative revolution that I as a writer crave, but it is a battle within it, and the revisionists, as balmy as they can be, are on the right side. It’s unfortunate that class plays a role here, that some of these maniacs want to dethrone Shakespeare for a Queen or a Lord, and possibly for the wrong reasons. The issue confuses the sides of the skirmish; it’s easy to see the traditionalists as defenders of the middle/lower class. But this isn’t a class war, it’s a creative war, a war against 21st-century assumptions of lone genius (which, applied to Shakespeare, are just wrong), and against a kind of conservatism, a kind of atavism, that will choose the backlist over the frontlist, that will choose the past over the present—that will choose the dead over the living, and over the truth.